An important reminder to reflect over what we prioritize in terms of knowledge. I was flipping through my blue Physics text book, which had exactly 796 pages. “Oh God,” I whispered to myself. Will I really be asked to read 796 pages worth of Physics? And then will I be expected to understand the information, and later apply it? I most certainly did do all that and more in my school years, as I incessantly solved past papers and did random exercises to pass my exam. I remember finding my Economics book in my bag too – another 900 paged monstrosity – oh and did I mention we had an entirely new one (almost equally healthy) to discuss the Macro part of it? Surely, I did not forget my favourite English Literature did I? Only three plays by William Shakespeare and a delightful novel by Tennyson, and a couple of others. Then there was Psychology, with that teacher who was such a hard task-master as we meandered through Freud and Jung and Erikson. As I look back at my academic years, I feel grateful for all the knowledge I acquired and can implement. One book however, got slightly overlooked. Totally overlooked, in fact. Where I learnt the principles of e=mc squared and all those rules of trigonometry or calculus, I think someone forgot to teach me the rules of Islam beyond the customary Salah and fasting. That one book that Allah sent down, and made incumbent on every Muslim to read and apply in their lives. It’s not like I didn’t read the Qur’an at all, of course. A Qur’an teacher came home every evening to teach me how to read the Arabic alphabet. He corrected my ‘Qaaf’ and ‘Haa’ and I happily repeated after him. I’m afraid I never wondered what the words that those letters consisted of meant. Qur’an was to be repeated and portions of it, like the Ayat-ul-Kursi, were to be learnt by heart and read at night, but that was it. In Ramadan, many in the family would read the entire book in only one month but there was hardly ever any talk of knowing what Allah was trying to tell us! So my childhood passed and I grew up into a confused Muslim who didn’t really know what Allah wanted from her. I certainly knew what Sigmund Freud said, but I didn’t know what the most perfect human being, our beloved Nabi, Muhammed (sallAllahu alayhi wa sallam) said. Where I read thousands of pages of curriculum books, and thousands more of novels that I liked to read, I couldn’t (or wasn’t made to read) that ONE book which consists of Allah’s Words themselves, and sent through His chosen Prophet Muhammed (sallAllahu ‘alayhi wa sallam) – which by the way, was far thinner than my ugly Economics heavyweight. I remember pondering over the words in books of psychology and trying to understand and apply them, although with the Qur’an, it was just repeat, repeat, repeat, and it wasn’t until I grew much older that I began to realize what a major faux pas had been committed! Why are our children made to read everything – everything except the Qur’an? We teach them swimming, ballet, French and Tae Kwando yet we care little if they learn about what Allah wants to convey? Why do we flounder like blabbering nitwits when people ask us about Jihad and Hijab and Salat in the Qur’an and not know exactly what is said, and promise to check with ‘Imam Google’? I am certainly not saying knowledge of the world must not be acquired. Indeed it is essential. But why do we so easily forgo the wealth of knowledge concealed inside the pages of the Qur’an, which in fact, should be the priority of all knowledge? Shouldn’t that be a part of our lives as well? Yes some of us had Islam as a subject but all we did was skim over the subject superficially and I distinctly remember that it wasn’t considered an important subject because it would not help with your university applications. In all those years of schooling, why didn’t we, those that are Muslims in a Muslim country, understand the Qur’an even once? 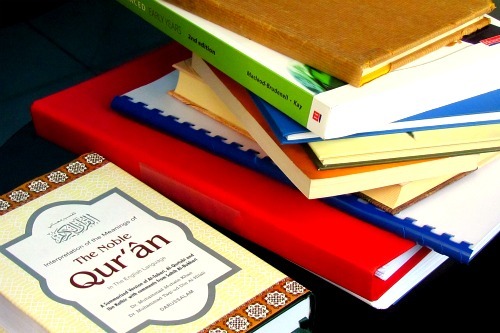 Why isn’t Qur’an integrated into our lives? Why is it so deliberately overlooked? Please don’t give me the explanation that the Quran is complicated and difficult to understand! Surely, so is Psychology and Chemistry and Sociology? It is no wonder that the Muslim youth being brought up in these so called ‘good’ schools have lost their identity in terms of religion, its values and lifestyle! A lot of young girls don’t cover simply because they don’t KNOW Allah wants them to! Most of the misconceptions, amongst Muslims and non-Muslims rise because of ignorance created through not having read our primary sources of Islamic law. It is an entire system of education that I have been deprived of while growing up. As I inch towards understanding and applying the vast treasure of knowledge in the best book in the world and of course the perusal of the explanatory notes and practical examples from the hadith, I hope and pray that my children and the future generations will not live in this darkness of ignorance and will be fortunate enough to READ. IQRA. MashaAllah! Wonderful message sis! :) Jazakallahu Khair for the reminder! Jazakallah khair for this very important post I completey agree with you that our youth must also be taught the Quran. Our youth are the future leaders of this world but if they do not know about the teachings of Islam they will not be able to attain full success! masha’Allah sister this was a well-written eye-opener! Hope to see more from you and have you ever considered writing for MuslimYouthMusings? It’s an awesome teen site! Asm, excellent article. Please, sister, continue your quest to raise awareness that the divine knowledge is the overreaching knowledge that all of us should attain. It is true that the majority of us focus on pronunciation rather than understanding, it is akin to reciting a doctor’s prescription without taking the medication! Not many of us understand that we should be living the Quran, and try to understand and implement its teachings in our daily lives. Yours is an extremely important and urgent message, and I hope it will reach many, Amin. Yes, certainly is a lovely site! At the moment though, time seems a major concern. Insha Allah later when things aren’t quite so hectic. Well said! the leaders point you make is v important. Jazak Allah Azlin, for the encouraging comment. I like the parable you mention. Very nice article. I totally agree with what you have written. Even after studying Quran and a bit of tafsir I still feel that there are still loopholes which need to me filled in me and it can only come through studying Quran over and over again. I sometimes feel that if I was given this education since childhood along with an islamic environment, it would have been easier for me to accept many reality of life which we tend to ignore due to the ignorcance in our deen. Subhan Allah! This is EXACTLY the story of my life and almost everyone I know! Jazakiallah khair for this beautiful and much needed eye-opening article. I’m most definitely sharing it insha Allah, in the hopes that it makes us aware that this ignorance of our understanding of the Qur’an is our biggest failure! JazakAllah x@hu! Parroting is right. Such a challenge to make sure our children grow up differently. Subhan Allah, we were discussing this exact same thing in uni today! Salaam Alaykum, good subject, compelling, ironic, and thought provoking. On a side note, I am very happy to see that articles not necessarily related to hijab are also getting published on this blog. This is important because hijab is simply one element of being a Muslim but wholly and intricately intertwined with many other elements, including the very matter the author wrote about. Masha’Allah, fantastic article…. Rings true with A LOT of us I’m sure!!! Insha’Allah we all set our priorities straight. Jazak’Allah khair for sharing! Yes, which is why the next generation might be somewhat better than what we turned out to be Insha Allah. Masha Allah tabarakAllah what a master piece!! everytime (or most of the time) I visit this website, I read stories that are similar to mine! masha Allah I used to be a confused Muslimah as well, and now alhamdulillah I am making the decision to teach my children the value of qur’an ( when I will get kids insha Allah!). I love the way you described things, and it is true, many of our young sisters do not cover simply because they do not know. May Allah ta’ala free us from ignorance. ameen. Jazak Allah. Best wishes with your children Sister. Really is the most challenging part of it all isn’t it? Me, meandering through motherhood, stumbling too often. May He guide us all to the most important knowledge of all.